Fyvie is a small village and parish northwest of Aberdeen. It is located close to Fyvie castle, which dates from the 13th century and is complete with towers and turrets and surrounded by parkland and a lake. Fyvie means either ‘deer hill’ (from the Gaelic fia chein) or ‘small cattle fold’ (from the Gaelic Cuithan, with the ‘ch’ sound changing to a ‘ph’). Ancestors of Annie lived in Fyvie parish in the 17th and 18th centuries, on various farms including Rothie and Starbrigs. 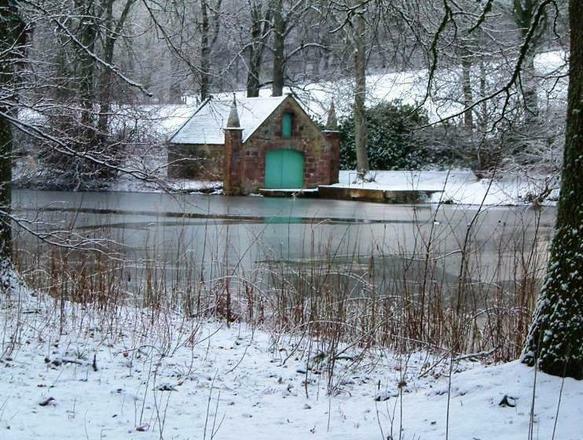 Boathouse and lake in Fyvie castle grounds. Unrelated to anyone in this family tree, but a beautiful photo by Stanley Bruce (Bard o’ Buchan). 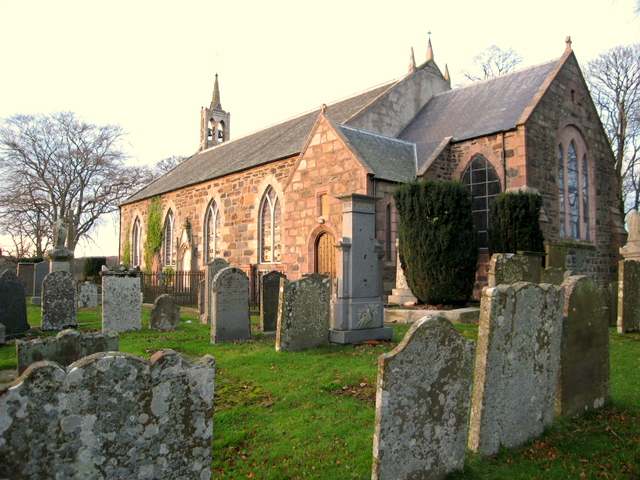 Several ancestors are buried in the Fyvie kirkyard, and some may have been married in the church, which was built in the early 18th century on the site of a previous church. In memory of ARTHUR STEPHEN d. Starbrigs 23 Feb. 1865 aged 84, his brother THOMAS d. Cottown, Auchterless Mar. 1861. His wife JANE AULD d. Bridgend, Turriff Jan. 1875. Their youngest son THOMAS d. New Deer 9 June 1882 aged 53, his wife MARY GRAY d. there 15 July 1905 aged 59. The younger Thomas Stephen was the father of Annie’s father, also Thomas Stephen, and thus was her grandfather. His wife (though not Annie’s grandmother) was Mary Gray, and his parents were the older Thomas Stephen (they were creative with names in those days!) and Jane Auld (also known as Jean). The older Thomas and Jean lived on the Rothie estate in Fyvie for a time, but I don’t know if Thomas and Mary ever lived in the parish.